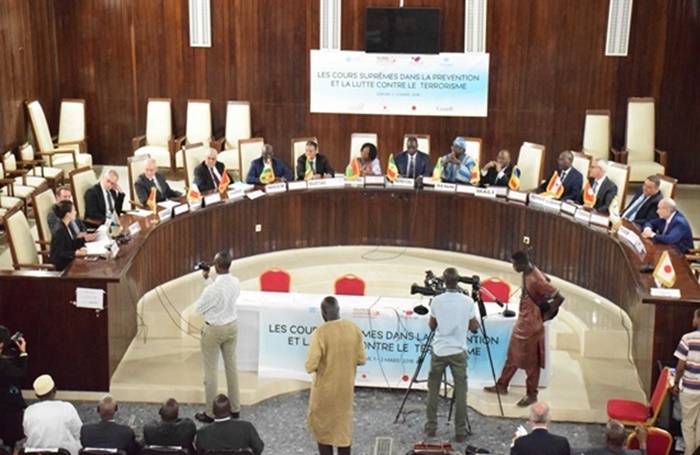 The Chief Justices and representatives of the highest judicial courts of Burkina Faso, Chad, Mali, Mauritania, Niger, and Senegal, and their counterparts from Canada, France, Morocco, Lebanon, and Tunisia convened in Dakar for a signing ceremony of guiding principles on the handling of terrorism cases in the region. The principles were developed by judiciaries in the Sahel with the support of the Global Center and its partners. The national seminar and roundtable events were hosted by the Chief Justice of the Supreme Court of Senegal. The adoption of the guiding principles marks a decisive step in the judiciary’s engagement in the fight against terrorism in the region. The document translates for the first time the political will of the Supreme Courts of the Sahel countries to present a unified front in respecting fundamental rights in the fight against terrorism, including on the protection of children and the need for a judicial framework for the collection and preservation of evidence where a suspect has been detained in connection with military operations. The project is part of broader UN efforts to solicit the views and guidance of Supreme Court Justices in informing international counterterrorism policy, and is a direct continuation of a program on supreme court justices in the Middle East and North Africa region, funded by the European Commission. The Supreme Courts’ engagement on the subject matter is a positive regional response that is in line with the international instruments, UN Security Council Resolutions, and the Global Counterterrorism Forum’s good practice documents. This roundtable signals the culmination of national-level study visits conducted over two years, with meetings hosted by the Chief Justices of the Supreme Courts of Mali (October 2016), Niger (May 2017), and Mauritania (July 2017). This project, funded by the governments of Canada and Japan, is implemented by the Global Center, Association of Francophone Supreme Courts, and the UN Office on Drugs and Crime, with the support of the UN Counter-Terrorism Committee Executive Directorate, and the International Organisation of La Francophonie.